On 5th September on the fifth day of my Mystical Circles blog tour, author and blogger Sue Vincent published a guest post from me on her blog Sue Vincent’s Daily Echo. This is the fifth in a series of blog posts in which I re-publish the articles in that blog tour. So here’s the piece Sue first published on her blog on 5th September. My inspiration for Mystical Circles came from a wide variety of spiritual practices, philosophies and worldviews which I have myself explored over the past decades. I wanted to tell a tale of family relationships, and how they are affected when one member of a family becomes captivated by a new spiritual outlook. Inevitably as in the case of most fiction authors, I have drawn extensively on my own life and experience. Also I believe it is true to say that when novelists create characters, although we certainly use real people we have met, most often those characters are a composite of different individuals. But one thing remains true: often there is a little bit of the author in every character. And that is true for Mystical Circles. In my novel, I introduce my reader to Craig, the leader of the spiritual group Circle of Love. And Craig would be impossible for me to create if there wasn’t a little bit of me in him, in his beliefs, his ideals, his longings, the spiritual outlook he wants to share with others. The Toltec Philosophy of the Yaqui Indian Sorcerers, as presented to a Western audience in the writings of Carlos Castaneda (whose book The Teachings of Don Juan: A Yaqui Way of Knowledge fascinated me). In this outlook, there are several different paths one may take, and one of those paths is the Path of the Warrior. There is a special group of skills which belong to the Warrior alone and one of those is to learn to erase your personal history. Craig takes up this concept, and aims to use it to teach his followers to move on from the past. For so many of us, the root of emotional and mental instability is that we persist in taking an emotional position about the past. Shamanism – this plays a part in Tibetan Dream Yoga which I explored during my years living in Australia. Shamanism in our own culture derives from Celtic times and incorporates the idea of shapeshifting – which also makes an appearance in my novel. The Human Potential Movement – the idea that we can be anything we want to be, if only we believe in ourselves, if only we master the arts of creative visualisation and positive thinking. I believe, from much experience, that this whole area, though extremely beguiling, must be handled with care… and we see some of its outworkings in my novel. My own past experiences include exploration of such practices as past life visualisation using crystals (in Australia), attendance of lectures on Reincarnation and many workshops at the Theosophical Society in London; and floating in an isolation tank (again in Australia), along with many other investigations into spiritualism, Buddhism , Transcendental Meditation and Transpersonal Psychology among others. In Craig, all this is presented in an extremely attractive and appealing Western package. The package incorporates a long-term stay in a gracious Cotswold manor house which many of us, myself included, might consider a highly desirable place to live, if only we had the money: an idyllic Country Homes type lifestyle. Craig himself dresses like a former cricket star turned TV personality, not like a traditional eastern guru at all. The lifestyle his followers lead is a rather indulgent one with lavish dinner parties and champagne. This hugely seductive package for his followers rests upon, we presume, though it is not stated, the fact that they have made over all their financial resources to Craig. In fact Craig, though full of idealism, is dependent for his material survival upon his own personal dysfunctional relationship with his wealthy businessman father. He relies on his father’s major weakness: a compulsion to try and buy his son’s love. In presenting the story of Juliet’s investigations at the Wheel of Love, and how the impetuous Zoe reacts to her older sister’s interference, I take a non-didactic approach. I myself have shared the hopes and dreams (and for some of them, the emotional damage) of the characters in this novel. Dramatic tension is high. One reader wrote that it was “the dangerous group dynamics” which intrigued her most. If Mystical Circles sounds like your taste do try it! …And Back to the Writing Again…. Posted on September 19, 2017 CategoriesBooks, British, British psychological suspense writer, creative writing, inspiration, London, love, modern Gothic fiction, New psychological thriller fiction, paranormal thriller fiction, psychological suspense fiction, SC Skillman, SC Skillman Author, UK, WritingTagsbook WIP, modern Gothic, psychological suspense, SC Skillman author, second draft, writers conference, writing4 Comments on …And Back to the Writing Again…. For novelists these days there comes a time when, having devoted our time to promoting the novels we have already written, and having listened to the alluring voices of the internet sirens ( see here for my post on this subject) we return to our raison d’etre again: writing. Having finished the first draft of my WIP in June I’ve now printed it out and this afternoon will read it through ready to make revisions for a second draft. This is always an exciting and a nerve-wracking time, and it’s a time I love because during the first read-through I usually find all sorts of new thoughts and questions and connections popping up, which I scribble on the manuscript; often things that never occurred to me during the time of writing. I’m reading it as if it was written by a different person. Right now it feels as if I’m getting back to the purpose for all this; the joy of connecting again with my main protagonist and with all her issues and challenges, and taking her through her story again, with all the other characters who will test her to the utmost, in their many different ways. It’s a psychological suspense / modern gothic novel set in London, about a young actress who finds herself trapped with a troubled priest in a house haunted by a family curse. I’ll have to leave it again on Friday as I’m going to a writers conference for the weekend. But I’ll have the chance to test it out on Saturday during a chat with a London agent and with the publishing direcor of Picador. So see you next week when I’ll be able to report back from my weekend at ScotsWrite, a Society of Authors Conference in Scotland. The UK Games Expo had not been on my radar until Richard Denning one of the Games Expo directors and a historical and fantasy novelist, kindly offered me space on the Authors Stand in the Birmingham NEC during the weekend Friday 2 – Sunday 4 June 2017. So there I was for three days, sharing a stand in a huge venue with some very popular and successful authors, as I displayed and sold copies of my three books, Mystical Circles, A Passionate Spirit and Perilous Path. This was a fabulous opportunity. The gaming world is one that I haven’t paid too much attention to in the past, but the whole weekend was a revelation. The atmosphere was vibrant; colourful characters and a dazzling variety of games and gaming accessories abounded, all contributing to the fun and good humour which was evident among the exhibitors and visitors. Jonathan Green who writes sci fi, fantasy and adventure gamebooks;and Gareth Baker, children’s writer. I also met Ian Livingstone, fantasy author and entrepreneur, and co-founder of the Fighting Fantasy series of gamebooks. He came to do a signing and long queues formed as his fans flocked to the stand to have their books signed and to chat to him. I had the chance to exchange ideas and learn better ways to promote myself as an author, and there was a great sense of camaraderie among all those exhibiting their books on the stand. Meanwhile, many cosplay enthusiasts strolled past in wonderful costumes. Transformation was the name of the game as so many took on the personnas of multifarious game characters and archetypes. I gained some new insights into how my own WIP is indeed using some of the gaming tropes, for instance, the predicament of the main protagonist as she finds herself in a deadly situation from which she must escape – hidden chambers and secret passageways and dark rooms all find their place in my novel, and these elements are very popular in the gaming world. Also the Gothic genre – which I now work within – has a close relationship with the gaming world. So there was an unexpected connection for me, together with the fact that I’m using paranormal and supernatural elements more and more in my fiction, and also would like to move more into fantasy in the future. Perhaps I have inspired you to try the UK Games Expo yourself next year! Mystical Circles will be published by Luminarie in a new third edition on 31 August. Instead of the present cover, it will have a new cover created by the designer behind the cover of A Passionate Spirit. The cover design will be darker and more mysterious than that for edition 2, in keeping with the tone of the story, and will harmonise with A Passionate Spirit. Both novels share themes of psychological tensions, spiritual threat, religious cults, paranormal, and shape-shifters; and both are set in the same Cotswolds manor house. Although each story can be read and enjoyed as a stand-alone, the second does follow on from the first, and draws through a couple of the characters who appeared before. So to demonstrate more clearly the connection between the two, a thematic relationship will be seen in the two cover designs. More later when I’ll be able to give the cover reveal! In addition my book of encouraging tips, insights and reminders for writers, Perilous Path: A Writer’s Journey, will be published in a second edition with Luminarie, on the same date – 31 August 2017. The new edition of each of the above books will be available as a paperback and as an ebook. 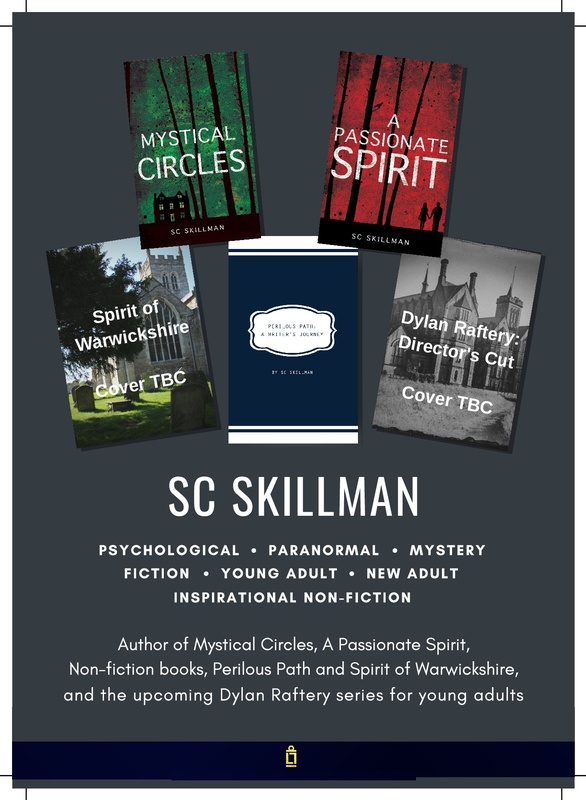 Mystical Circles paperback will be priced at £8.99 to bring it into line with A Passionate Spirit, and Perilous Path will be available for £4.99. Meanwhile I’ve reached 70,581 words in my third novel, Director’s Cut. This will continue the themes of my first two novels, with a strong emphasis on modern Gothic. I know the way the story is to end – but my main antagonist is more frightening, subtle and cunning than those in my first two novels, and the power struggle with the chief protagonist is nearing that ‘black moment’ when it seems all is lost. I still don’t know how she is to survive or to prosper, through the things she will learn from this encounter. Perhaps that’s the best way for it to be, when creating a first draft; to maintain a dynamic relationship with the characters and their inner worlds, there must be a strong element of uncertainty. If the author is to defeat the reader’s expectations, she must first defeat her own! From 2nd to 4th June 2017 there will be a big event for games players and lovers of fantasy, thrillers and roleplay at the NEC Birmingham. There’ll be four authors at the Expo, of whom I am one. Click here to find out more about the authors Jonathan Green, Richard Denning, Gareth Baker and myself. You’ll find us on Stand F11. We’d love to see you at this exciting event! Click here to find out more about the show and how to book tickets. What do the Secrets of the Australian Swagman Have to Say to Creative Writers? Posted on March 21, 2017 CategoriesAustralia, creative writing, inspiration, life, nature, places I love, SC Skillman, SC Skillman Author, thoughts, travel, WritingTagscharacters, creative, inspiration, life, life experiences, novel, plot, SC Skillman author, skilll with words, writing3 Comments on What do the Secrets of the Australian Swagman Have to Say to Creative Writers? “Ashes are much hotter than flames”. This is an observation I heard online a few months ago, and you’d think, OK, what does that have to do with creative writers? Well, let me take you to the Australian Outback to explain. The ‘swagman’ of Waltzing Matilda fame traditionally goes walkabout through the Outback of Australia with only 3 basic foodstuffs in his tucker bag: onions, flour and golden syrup. That’s so he can bake the essential carbs portion of his diet, damper, in the ashes of his fire, (to eat later with syrup) and also the onion, an indispensable companion to the ‘jumbuck’ that he’s poached from whichever sheep-station he happens to be passing through. So what does this have to say to creative writers? Simply this: writing a novel can be like making damper from scratch in the Australian bush. You gather together your basic requirements; wood for a fire, pot to make your damper in, flour and water, and off you go. Your fire must be just right; no more flames, but nice hot ashes, ready for the cooking. The pan is placed on the ashes and heated up ready to take the mixture, and for the lid to go on. Then the pan is covered with hot ashes and left to cook. the hot ashes are later swept away with a sprig of greenery. Every stage of the process requires careful attendance and skill. And finally you have your delicious result, ready to be devoured. But first you make it more palatable by putting golden syrup on it. Just so do you gather your raw material for a novel in your mind, your life experiences and observations, your characters, their life-histories, your plot, your skill with words, and then you go about mixing them all together, through several drafts, each stage carefully attended to, so that your end result is just golden brown, and not burnt nor soggy. And then even when it’s perfect, it may be it needs that extra touch, with the syrup on top ie. the final polish.